Today is the fourth and final day of the annual sewing and stitchery show at the Washington State Fair Grounds. We are wrapping up our first time exhibiting at this unique event. The last time I was at the fairgrounds was as a newlywed visiting the 1995 Puyallup Fair (since renamed the Washington State Fair). The scones, oh my the scones. These amazing treats have been a part of the Fair since 1910 and I was happy to enjoy a warm one yesterday. Twenty years ago Lori and I had just started our marriage and business. Today finds us with a maturing business (and marriage) and thousands of dollars in hand dyed silks at a sewing show. 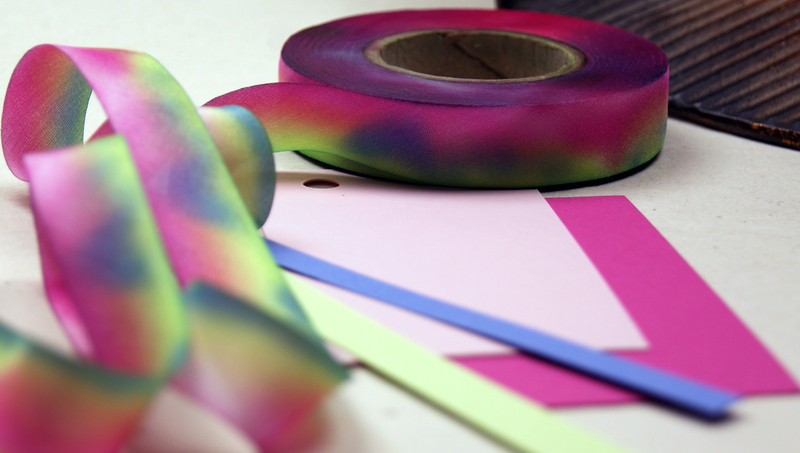 Next year we will be better prepared with small project kits for silk flower making and fabric embellishments. Our silk customers have recommended this show for years and now we know why! With over 30,000 paid attendance we were happy to find the aisles full of crafty customers. The Sewing and Stitchery Expo SewExpo is the largest consumer sewing show in America. There are more than 100 daily seminars, workshops and shows. There are over 400 booths packed with tools, supplies and fabrics. I spoke to attendees from South Carolina, Arizona, Oregon, Idaho, California and Texas. I saw a license plate in the parking lot from Tennessee! You can buy a four day pass for $40 or visit one day for $12 to see a non-stop series of demos on the Free Stage and fashion models on the Expo Runway. The daily hands-on classes always draw a crowd as participants learn a new technique and leave with a finished project. We hope that if you found us there this year you will be back for more silk ribbon next year and if you have not attended this event before you will come see what all the fuss is about. 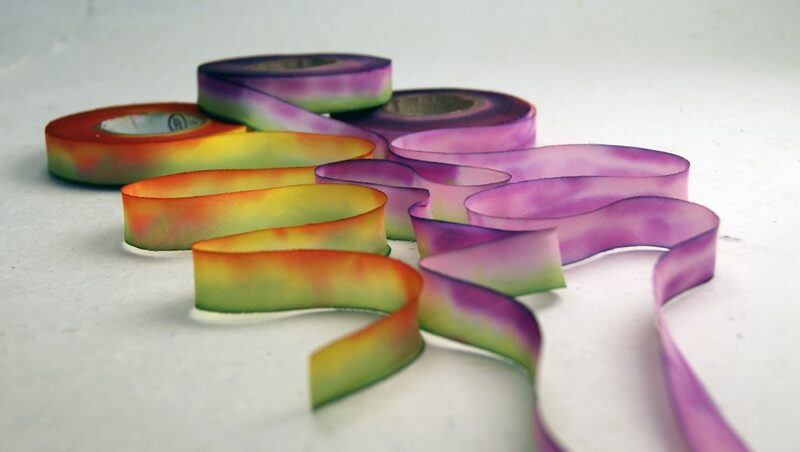 Custom blended colors in our hand dyed silk ribbons create some of our most unexpected treasures..
Real Card Company sent us 4 different color swatches and asked if we could make a ribbon blending all of the colors together. Our colorist did a great job matching the swatches and the results turned out beautifully. We love these type of projects as it’s always fun to see how the new blends are going to turn out. All of our silk ribbon is dyed in our Seattle studio. 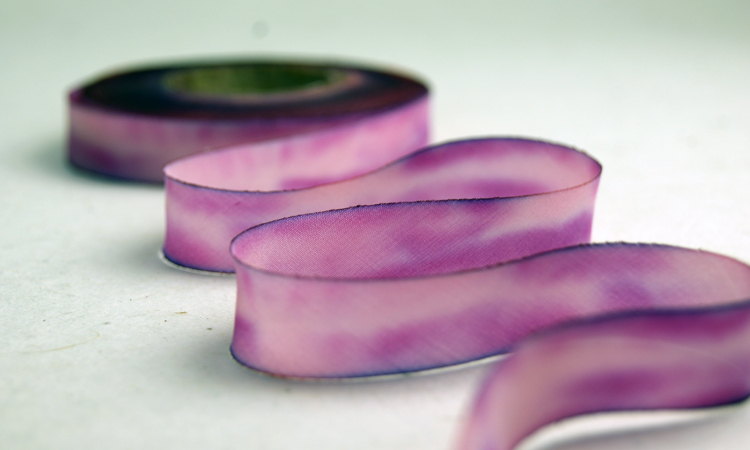 Earth Silk ribbon comes in five different widths and two different finishes. Our 100% silk which has a matte finish and our 100% silk satin which has a satiny light catching side. 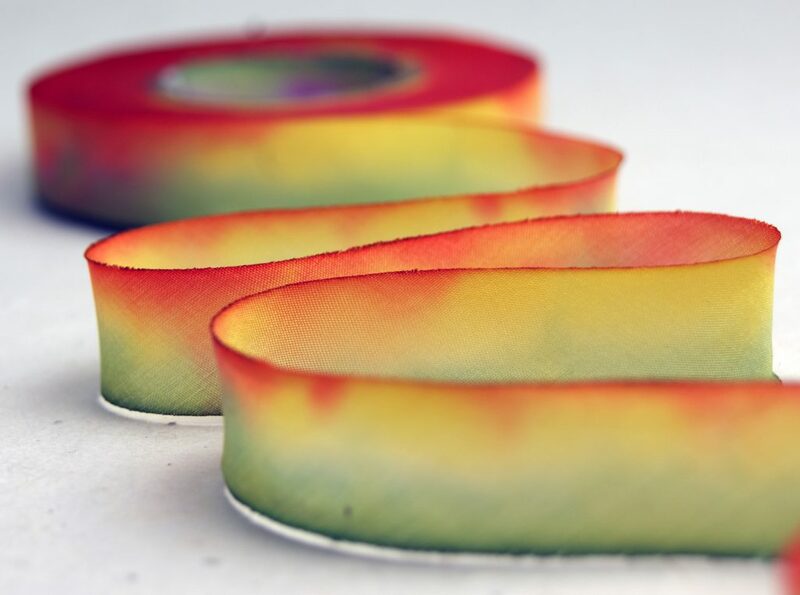 Our ribbon is all bias cut and is available by the spool as well as in cut lengths (depending on the collection). Of The Earth has created an extensive collection of colors with over 150 to pick from. 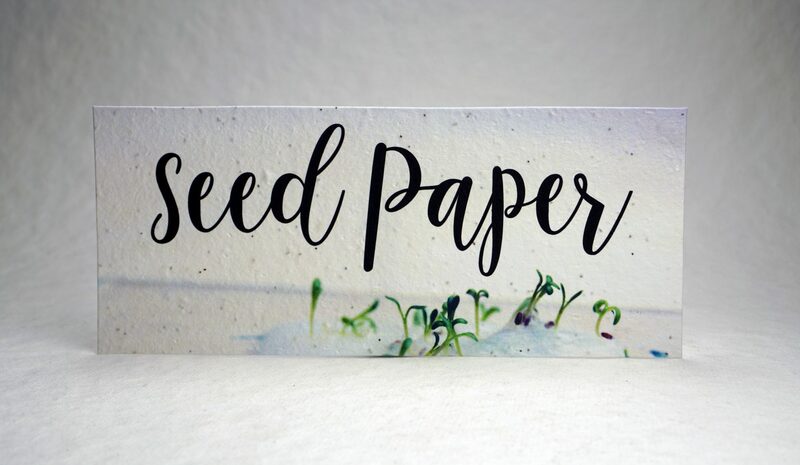 Real Card Company is an invitation company based in Seattle, WA. You can find them at www.realcardcompany.com. 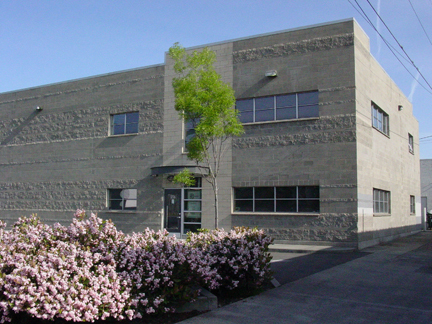 We have been in this great Seattle location now for three years, it seems time to post a photo of our space! Located in the flight path of Boeing Field we had President Obama flying overhead twice last week for campaign fundraising events. We are so close to the end of the runway, he was literally within 250 feet (straight up). We can always tell something big is up as all other air traffic stops in advance of a presidential arrival. We hope you can stop in and see our hand dyed silk ribbon and paper making efforts.